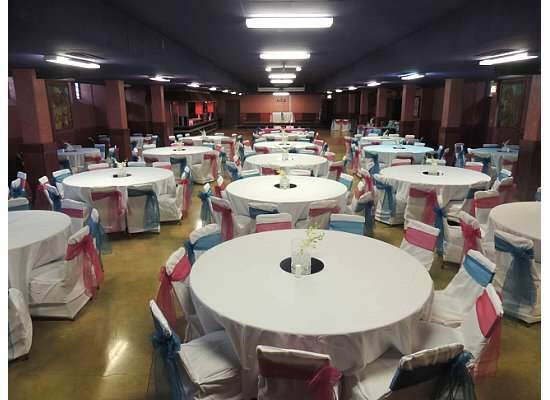 We are excited to have a Parish Banquet Hall with AIR CONDITIONING in summer and plenty of HEAT in winter. The efforts and generosity of many people remodeled this space for the benefit of all. We beg you to treat our facility with care and respect. Proceeds from the hall rental help us maintain our Parish properties and programs. Although, there may are more beautiful and more expensive sites available, please consider that renting our hall, also supports our parish and ministries. Thank you for considering us for your event. Saturday: 6:00 p.m. - 12:00 a.m.
Sunday: 2:00 p.m. - 6:30 p.m. Specific Parish Guidelines Apply, we offer a 50% discount for Sunday Social Events. Check our General Calendar on this website, Saturday evenings 4:00 pm to midnight, it will state if your date is available (open) or reserved (taken).